So the first quilt top of 2013 has officially commenced! I started the Sisters' Ten BOM from Gen X Quilters yesterday afternoon. I've never done a BOM before, and I think it's going to be way fun. The first block went well, it just took me longer than I expected. I don't usually follow directions or patterns when I'm quilting, I usually just make it up as I go along, so that was a little different. Picking out fabrics out of the stack. Final pull, all crisp and freshly cut. I realized that I needed a large print for the center block, and I pulled the two I ended up using out of my stash. I think they worked out really well! I'm not sure how I'm going to feel about the blue background of this square once a few more are done; I wasn't planning on using any blue anywhere else in the quilt, and I think it might stick out like a sore thumb. We'll see, I guess! Megan - Warning! This is going to be a passive aggressive comment. Love your blocks! Didn't need to know that a BOM just started up. I hate BOMs entirely. 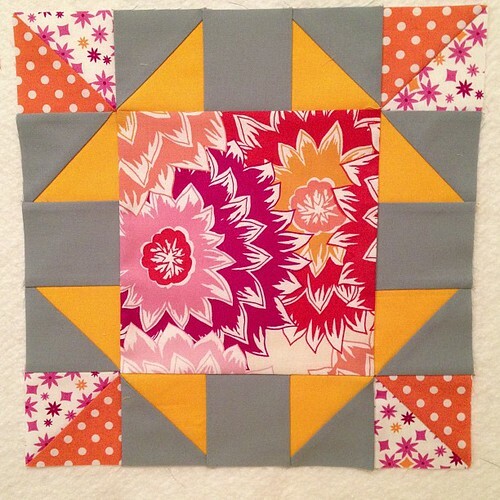 I always start and end up with some seriously ugly blocks that show up around June and I say to myself. WTF!?!? Who would want to cut fabric up for that!?!?! But this BOM is different. They have the whole design out there and it's awesome. Crap! I want to do it now. Thanks, Megan! Thanks for making an adorable block that I now want to start ANOTHER project! Still love your blocks. Usually, I'd say, "Add a pop of orange to spice it up." That is not going to help here. I guess a solid black might spice things up once you get tired of it. I have to search my stash for something crazy enough. Love! 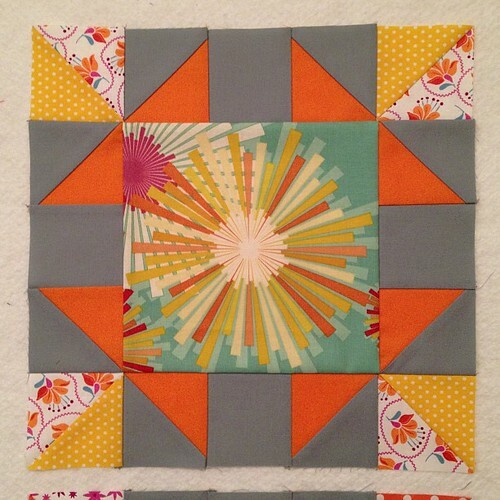 Both blocks are great and really nicely pieced. Enjoy that BOM they are totally addicting. Very nice Your centers are wonderful. OH my! Those are beautiful prints for that block! I predict a beautiful final product! That is a really cool block. That focus fabric makes it look like a ton of tiny pieces but then when you look it's just a print. Still a stunner though. SO pretty! I love the firework in the center. I don't know what the rest of the quilt will look like, but at least in that block, it looks fabulous!